The Memphis Grizzlies today announced a Pre-Black Friday ticket promotion to tip-off the Holiday season, giving fans the option to dress up their Thanksgiving with three games for two days and one turkey of a deal. 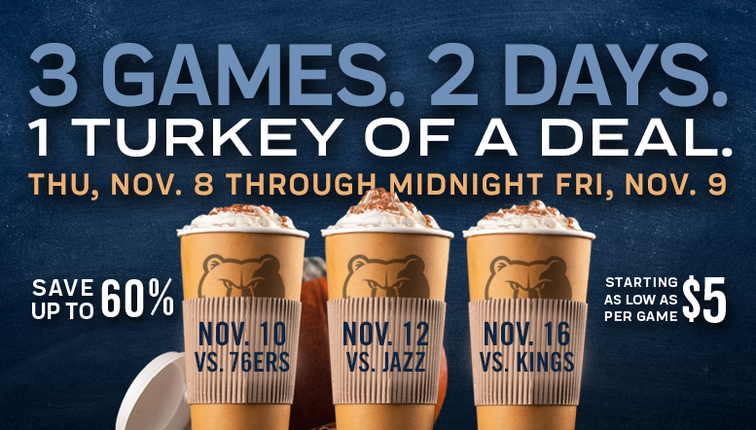 Starting this Thursday, November 8 through midnight Friday, November 9, the Grizzlies are giving fans a pre-Black Friday deal where select tickets for the November 10 matchup vs. Philadelphia, November 12 game against Utah and the November 16 game vs. Sacramento are up to 60% off with tickets starting for as low as $5, while supplies last. Tickets for this limited time offer are available for purchase at the FedExForum Box Office, all Ticketmaster locations, Ticketmaster.com, online at grizzlies.com/tickets or by calling 1-800-4NBA-TIX. Fans can also expect more ticket promotions and savings in the coming weeks with upcoming Black Friday, Cyber Monday and Holiday Pack Deals! For more details, visit grizzlies.com or call 1-800-4NBA-Tix. Fans who want to support the Memphis Grizzlies and purchase 2018-19 Season Tickets and 10-Game Flex Packs can do so now by calling (901) 888-HOOP or going online to grizzlies.com/tickets. Single Game Tickets are now available for purchase at the FedExForum Box Office, all Ticketmaster locations, Ticketmaster.com, online at grizzlies.com/tickets or by calling 1-800-4NBA-TIX. For more information on the Grizzlies, visit grizzlies.com, ‘like’ Memphis Grizzlies on Facebook or follow on Twitter and Instagram (@memgrizz).